This (open access) book explores and illustrates the use of geo-information in the planning and management of urban regions. The book has been edited by ITC’s Martin van Maarseveen, Javier Martinez, and Johannes Flacke. ITC staff and alumni authored several chapters. The overall aim of this book is to contribute to capacity development in using GIS for urban planning and management topics. With this in mind, some of the chapters have included exercises developed by André da Silva Mano that enable readers to reproduce the analysis with QGIS open-source software. GIS is used today to better understand and solve urban problems. GIS in Sustainable Urban Planning and Management: A Global Perspective, explores and illustrates the capacity that geo-information and GIS have to inform practitioners and other participants in the processes of the planning and management of urban regions. The first part of the book addresses the concept of sustainable urban development, its different frameworks, the many ways of measuring sustainability, and its value in the urban policy arena. The second part discusses how urban planning can shape our cities, examines various spatial configurations of cities, the spread of activities, and the demands placed on different functions to achieve the strategic objective. It further focuses on the recognition that urban dwellers are increasingly under threat from natural hazards and climate change. 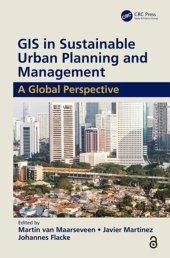 Written by authors with expertise on the applications of geo-information in urban management, this book showcases the importance of GIS in better understanding current urban challenges and provides new insights on how to apply GIS in urban planning. It illustrates through real-world cases the use of GIS in analyzing and evaluating the position of disadvantaged groups and areas in cities and provides clear examples of applied GIS in urban sustainability and urban resilience. The idea of sustainable development is still very much central in the new development agenda of the United Nations, and in that sense, it is of particular importance for students from both the Global South and Global North. Professionals, researchers, and students alike will find this book to be an invaluable resource for understanding and solving problems relating to sustainable urban planning and management.